Ok electronic gurus, what am I doing wrong? This cable is no longer made by Raymarine and someone was gracious enough to send me their's when they pulled their old electronics out. Unfortunately he had to cut the wire, and now I'm trying to put it back together. I cannot figure out how to get the connector off in tact so that I can notate which wires go to which pins, so I'm trying to solder it back together. Except this is not regular copper wire. Its silver and the solder is not melting to it. I have thin strand electronics solder, but do I need something special? My iron is hot enough to melt the solder but I cannot get the wire to accept it. Any advice? Or do any of you know how to remove the connector? I don’t think your supposed to splice them, but I have with no issues, just plain ole crimp splice. Hole I needed to get it through wasn’t big enough for the connector. I assume you just push the pins out with the correct tool that unlocks the pins, they are not hard to come by, look for pin extractors. However I’m not sure what that gives you, unless you have new pins and the proper crimping tool etc. I'd prefer to take the connector off and reconnect the long piece directly to the connector, however if I do that and cannot maintain where each internal wire went i wont know how to put it back together. So splicing is my only option right now until I come up with something else. I was editing my post when you replied, read what I said about pins. Maybe take it to an electronics shop and have them put a new end on it? Use a multimeter and touch one end to a pin and then to each wire. When you have a match the meter should show zero ohms. I took the "bubba been here" route and stripped each wire, twisted them, and put electrical tape on them. I'll test out the transducer, and DSM25 tomorrow and make sure they work and communicate to the A65 chartplotter. If they do, I'll bring it to a local shop and pay them to reconnect the pins properly. First, you may not be able to open the connector if it was a molded-on factory cable. Next, if the solder won't adhere to the wire, it's because the wire is oxidized or not clean. You need to either cut back to clean copper, or carefully scrape the wire until it's shiny bright, then use a bit of soldering paste which helps clean and prevent the heat from oxidizing the wire before the solder hits it. Soldering does take some practice, given that you have a limited amount of cable to work with, I suggest you try on other / scrap bits of wire until you get the hang of it, and/or get someone to show you how its done (any radio amateurs or electronics hobbyists around?). Come to think of it, there are probably lessons on Youtube, though I haven't looked so can't vouch for them. I have spliced several 183’s over the years. As someone else said, I used the ‘stripped & soldered each wire’ technique because I don’t think you can get into the molded plug. But unlike the photo shows, it always best to cut much farther from the plug so you can do a ‘feathered or staggered’ splice. Using this technique each wire can have its own small length of heat shrink tubing and after soldering... shrunk down. Start by first removing a 6” piece of coax shied over one end and slip it down out of way. Then do same for 10” heat shrink of right diameter... slip it out of way. Then start with each wire splice by furst slipping over a small dia heat shrink and soldering the splice, shrinking the heat shrink. Repeat the process to the next the next non-overlapping splice area was with heat shrink and soldered connection. Repeat until done. This might eat up 6” of length. Then slide over the 7” piece of coax shield and solder its ends to the 0183 shields. 183 cable should have a good continuous shield to keep RFI from other devices, radios from causing interference and vice-versa. Then finally slip over the 10” piece of heat shrink over the whole splice area to keep it dry. But using a multimeter as AKA mentioned is probably faster. You might also be able to find a "field installable" plug for it, although attaching those can often feel like brain surgery with tiny screws and close tolerances. When you solder a splice, be really careful that the splice is well secured and protected where it runs, as solder can be brittle. It can often be a good idea to create a strain relief loop so that the splice is protected from any pull or force on the wire. 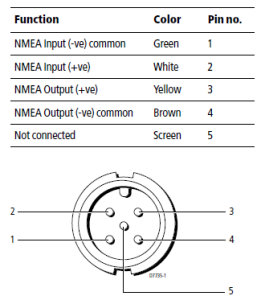 Nmea 0183 is just a serial connection. The current is tiny. You can just twist the wires together, then tape it really well, it would work fine for years. High current connections - use crimps, the only way to go. Video connections - anyway but shielding helps with noise for analog video. This means that analog video cable is very easy to splice as it is just analog video and signalling. High frequency, high current applications (radio) - here you have to follow directions to the word. Otherwise performance will be severely degraded. I have never had any luck repairing or reusing such a connector. If you are lucky you may find a manufacturer name somewhere and if you are even luckier may find someone to sell you one (rather than 1000!) online. And then you have to put it together properly. A tapered splice as described is the right way to do it but you don't have enough wire in the connector end. I would remove enough cover from the long end so that you can slip some heat shrink on each wire before soldering. Say 4 in or so and 3/4 inch of tubing on each wire. Try to fold back the shield or carefully unlay it and twist it back up. Your wires are "tinned" (silver looking) so that is good. But it is hard to heat the wire because of the difficulty getting heat to flow from the soldering tool to the wire. I try to hold the cables tight in a vise to stabilize them(unless you have four hands:-) then overlap and twist together a pair of wires. Don't forget to put on the heat shrink first. Then heat your tool and place a small bit of solder on the top of it. Place this under and up to the twisted joint. The bit of solder should make enough contact that the wire will heat up. Wait a few seconds then touch your solder to the *wire* and hopefully it will flow out. Practice first would be an excellent idea. The shield will have to be soldered together after forming it into twisted strands then maybe wrap it all in tinfoil before wrapping the finished join with electrical tape. will probably not look pretty but it should work just fine. Or until the slightest pull on the cable pulls it apart. That wire should be solderable. Just take it to someone who knows how to do it. Be careful of using soldering paste. Acid paste will eventually destroy the wire. Use only solder meant for electronic work and stick with the lead/tin solder, not the lead free stuff that is being used today. Best to use the white/clear crimp on connectors for this small probably 22 Ga wire. When there is little to work with it helps to solder the ends of the individual wires just a little. You don't need and probably don't have room to try and use a regular crimper because of the short wires. But the plier ends of one of the wire strippers or a nice set of needle nose pliers that allow some good clamping pressure will do. To solder you MUST use the proper Flux. Without flux you are beating your head against the wall. Must be Electronics flux not plummets flux which is acid based. Electronic companies sell the small crimps - like Sherco online store. Had to put together a radar setup a few years ago when installing a second hand Simrad. Used it for years. Also used these to build a Seatalk NG to NMEA 2000 Backbone adapter from male/female field installable ends because no commercial one is available. If you try and go the soldered only route put the proper small diameter heat shrink on and strip the outer casing of the cable back far enough to allow the heat shrink to be far enough from the connections that the heat doesn't shrink it down whee you don't want it. And before putting any of the small ones on put one or two large diameter ones over the entire cable and push back out of the way till all is confirmed as working then slide them over the entire splice to make it nice and rigid and give it some pull strength. If you use the crimps you can probably just get away with silicone repair tape pulled up nice and tight. I have a pile of old Raymarine cables (new ones) from installs. If your interested,take a picture of the connector and post it.